Our buddy Ben Higgins with ABC 10 News and XTRA Sports 1360 radio almost got drilled yesterday doing a post-game broadcast after SDSU Aztecs got their first ever NCAA Tournament victory. Here’s the link. Nice work keeping your cool, Ben. Seriously, who the eff is driving this SUV? I’ve seen news crews set up and do live interviews. Giant spot lights, cameras, usually a huge freaking truck with a satellite rocket launcher coming out of the roof. This joker just keeps backs right up into all of it… like a damn mosquito getting lured into a bright light before getting zapped. Tractor beam… sucked me right in. I’m not trying to get into racial or gender stereotypes, but if I had to put money down on who was driving this thing… I’d definitely put my money on… um, white male. Yep, definitely a white male. 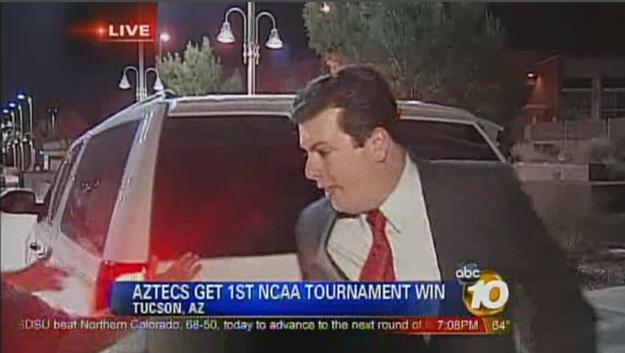 This entry was posted in Basketball, March Madness, News, Sports, TV and tagged ABC 10 News, Aztecs, Ben Higgins, March Madness, NCAA tournament, SDSU, Sports Reporter Almost gets Drilled by SUV on Live TV, XTRA Sports 1360. Bookmark the permalink.